AJA Video Systems today released the free v10.5.1 Mac software driver package adding 4K/UHD high frame rate support to AJA’s Io 4K, its popular device for professional video I/O, updated and customized for Thunderbolt™ 2 technology and the latest 4K workflows. The new software upgrade adds Io 4K support for 50,59.94 and 60 fps capability at 4K (4096 x 2160) and UltraHD (3840 x 2160) resolutions. This high frame rate support is critical for the latest 4K and UltraHD broadcast and motion picture workflows. The v10.5.1 software also adds new format support into the AJA DataCalc desktop app, and support for progressive (P) v. Psf selection in AJA Control Panel software, along with overall performance and format support enhancements to Io XT, Io Express, T-TAP™, and the current KONA lineup of capture cards. Io 4K offers a broad range of professional video and audio connectivity, supporting the latest 4K and UltraHD devices. Io 4K connects to any Thunderbolt™ 2-enabled device such as the new Mac Pro, and uniquely offers an additional Thunderbolt™ 2 port for daisy-chaining other peripherals in supported workflows. AJA’s proven conversion technology allows realtime high-quality scaling of 4K to 2K and UltraHD to HD. Io 4K seamlessly integrates with leading broadcast, post-production and delivery tools such as Final Cut Pro X, Adobe Creative Cloud, Avid Media Composer, AJA Control Room and more. AJA was one of the first out of the gate with support for Thunderbolt with their Io XT and T-TAP™ products. 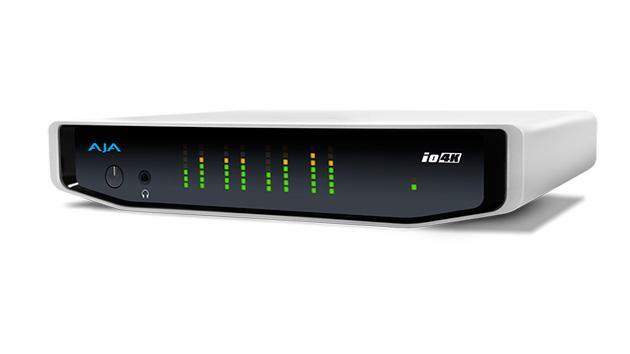 Thunderbolt ™ 2 enables unprecedented high-resolution workflows for video professionals, and AJA has designed an ideal product in Io 4K to take advantage of that bandwidth. Io 4K is now available via Safe Harbor at a US MSRP of $1,995. AJA Mac Software v10.5.1 is available as a free download today from http://www.aja.com/en/support/software. For more information please visit http://www.sharbor.com/products/AJAN5010084.html.